In an installation for Philadelphia Contemporary, artist Jane Irish expands on her years of painted explorations of colonialism, opulence, the violence and futility of American conflicts overseas, and the anti-war activists who resist them. 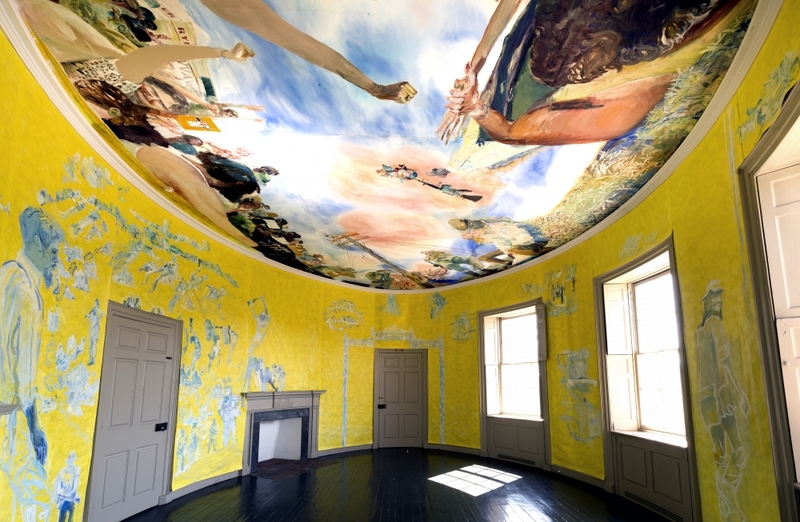 Working in collaboration with Fairmount Park Conservancy, Irish transforms the historic Lemon Hill mansion, filling it with a floor-to-ceiling installation of paintings and ceramics. Irish envisions that the two floors of Lemon Hill serve as antipodes—hemispheric opposites, each filled with her dialectical imagery of past and present, east and west, and war and peace. Its interiors coated with Irish’s swirls of painted vignettes, Lemon Hill becomes a site where visitors consider how activists might serve as an antidote for past sins, and art’s ability to foresee the wildest scientific futures.